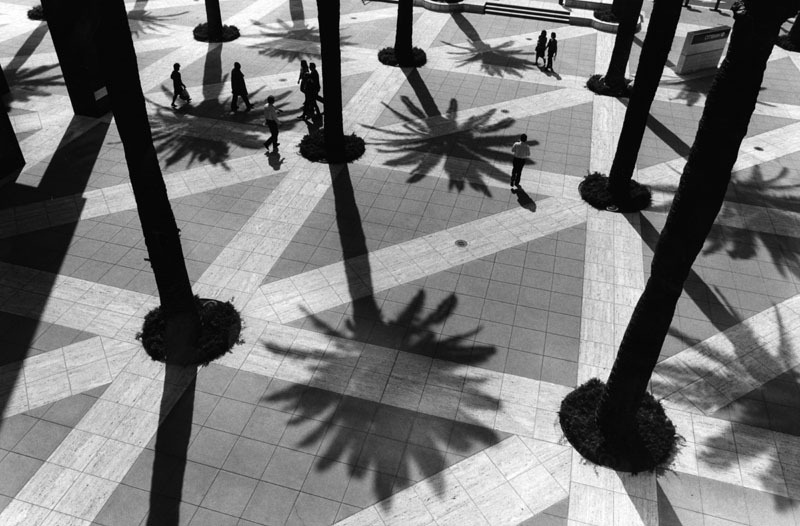 Palm trees in the Citibank plaza courtyard at 5th. and Flower Streets. March 21, 2000. Through the course of this five-month project, I discovered that I was simultaneously familiar with Downtown and a stranger to it. As a child I spent quite a bit of time in my father's women's clothing factory on Los Angeles Street near 9th. As an adult I photographed throughout the city for the Los Angeles Times, yet - given our car culture - I had never really experienced Downtown as a pedestrian. What I saw immediately was that the beauty in Downtown was subtle, not overt like New York or Paris, but that it was well worth the walk. The visual juxtaposition of pedestrians, automobiles and architecture is purely and uniquely Los Angeles. It is undeniable that parts of Downtown are gritty but a strong economy and ardent preservationists are bringing buildings and communities in other areas back to life. The heart of today's Los Angeles is multi-ethnic, multi-cultural and vibrant. When I began going into people's living and working environments I continued to see this vitality and diversity, but with a common bond: love and pride for Downtown. I chose to photograph in black and white because of the radiant light that exists here in Los Angeles. Not only did it shape these images, but more profoundly, I feel that it shapes how we live here. I would like to dedicate this exhibition to my late father, George Roth, and to all the other immigrants who built their dreams in Downtown Los Angeles. I would also like to thank everyone who let me into their lives and made this project possible. All photographs copyright Marissa Roth/Los Angeles Public Library.